This play has 5 more performances – tonight through Saturday at 8pm, also Sat and Sun at 2pm. Next week Wednesday (Nov 11), the FireWorks series continues with Taylor Marie Graham’s Cottage Radio. Playwrights Guild of Canada is proud to announce that Shirley Barrie will be awarded PGC’s Lifetime Membership Award. 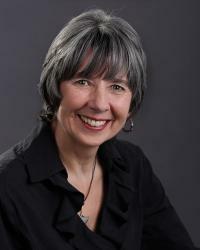 She was selected as PGC’s Lifetime Membership Award recipient for her outstanding body of work as a Canadian playwright, in addition to her years of service to Playwrights Guild of Canada. Shirley was the president of PGC from 2009 – 2011, but she served on the board in various positions for 8 years. Shirley’s work is expansive, multifaceted and truly unique, including award-winning plays such as Straight Stitching, Carrying the Calf, and Revelation. Her extensive use of female historical characters (Beautiful Lady, Tell Me…, Queen Marie, etc.) is particularly noteworthy. As a producer, she co-founded the Tricycle Theatre in London, England with Ken Chubb and from 1989 to 2003 she was co-artistic director with Lib Spry of Straight Stitching Productions. Shirley’s most recent play, I am Marguerite, premiered at the Alumnae Theatre in 2015. She has recently been nominated for Best Toronto Playwright in NOW Magazine’s 2015 Best of Toronto Reader’s Choice Awards. Her creativity and diversity of artistic expression is greatly admired by her fellow playwrights. Alumnae Theatre Company is delighted that one of its members is so honoured. In addition to the credits listed above, Shirley’s play The Pear is Ripe was produced at Alumnae Theatre in 2001 – one of our first member-written plays to grace the Main Stage. Measure of the World was part of Fireworks 2013, and most recently, Shirley dramaturged Chloe Whitehorn’s Divine Wrecks, which is part of this year’s FireWorks series in November. The FireWorks Festival runs November 4-22, 2015 with three plays each running for one week of the festival. For more information on the festival please see the FireWorks page of www.alumnaetheatre.com. Below are the character breakdowns for each play. Auditions will be scheduled August 17-23, and callbacks the last week of August. Be sure to include your RESUME, HEADSHOT, AGE RANGE and your PHONE NUMBER. Candidates selected to audition will be contacted. Please come prepared with a monologue. Directors from more than one play may be present at the audition. Callbacks will be done separately for each play. Members of Alumnae Theatre Company will be given priority consideration. The scripts are available at the Toronto Reference Library, 5th floor, Performance Desk, 789 Yonge Street. Auditions will be held at the Alumnae Theatre, 70 Berkeley Street (at Adelaide). PERFORMANCES: November 4-8, 11-15, 18-22. ​A high school god falls for the wrong girl, his teacher. A dark tale of heart break and revelations, Divine Wrecks explores the nature of love without boundaries. A modern take on a classic tale. EDDY: male, sixteen, troubled star athlete. After a tragedy he feels disconnected from everyone and is looking for meaning. CASS: female, thirties, high school English teacher. Is haunted by her past. CHORUS 1: male, teenager, confident jock. At the top of the school hierarchy but not the “steal your lunch money” type. CHORUS 2: female, teenager, fluffy pretty cheerleader. Extremely confident and used to getting her way. CHORUS 3: female, teenager, alternative look. Bit of a slacker “f**k-the world if the world doesn’t care” attitude. CHORUS 4: male, teenager, prep nerd. Shy but eager to be included. Inspired by the true events of the Goderich, Ontario 2011 F3 class tornado, Cottage Radio explores the effect of the horrific storm on the fictional, yet very recognizable Marley clan. The family is forced to deal with the horrific events of the storm that is currently bringing them together, while confronting all the past events that kept them apart for so long. The play includes gorgeous original indie rock songs performed by members of the collective live on stage, while the play gently and graciously combining humour and drama in surrounding scenes. The premiere production in Goderich, Ontario left audiences moved and the Toronto re-imagining is sure to do the same. Gordon Marley – 55 years old. Uncle to Christina and Nadine; son of Susan. Recently lost his house in the tornado. Over-indulges with alcohol, silence, and solitude. Past competitive rower. Christina (Chris) Marley – 32 years old. Sister of Nadine, granddaughter to Susan, niece to Gordon, childhood best friend of Jasper. Past drummer in the band Huron Haven; host of COTTAGE radio. she stifled her maturity at 17 years old and expects everyone around her to do the same. Uses sarcasm to deflect. Nadine Marley – 27 years old,. Sister of Christina, granddaughter to Susan, niece to Gordon, friend of Jasper. Guitar and vocals in the band Huron Haven. Is afraid to admit she misses everyone, has made some poor choices in the new people in her life away from family, and can’t handle everything all by herself all the time. everything is ok if it feels right. Very charming. Adventurous. Susan Marley – 84 years old, grandmother to Christina and Nadine, mother of Gordon. Is getting old and sees her family being ripped apart and unable to make proper adult decisions. All she can do is try to remind them of their ties to each other and their home before she passes on. Very dedicated to the tornado clean-up effort. The story of a forgotten Canadian hero, Dr. Vera Peters, and her fight to alter breast cancer treatment. Spurred on by patient outrage, memories of her mother’s suffering, and her own diagnosis of breast cancer, Peters embarks on a quest to find a gentler alternative to the mutilating radical mastectomy – and in the process sets the surgical world against her. HELEN, female, sixtyish, prim, conservative, fiercely loyal, wryly humourous nurse. ROSE, female, early fifties, brash, earthy, fiesty, feminist, political, professor of sociology. VERA, female, early fifties, caring, compassionate, yet quietly driven, chain smoking cancer specialist, accomplished medical professional, very “put together”. FRANK, male, early thirties, young, impressionable, thoughtful, ambitious greenhorn surgeon. BERNIE, male, fifties, conservative, intelligent, chauvinistic, surly, blunt, yet vulnerable Chief of Surgery.